When you visit Panama City and the nearby Panama Canal, you'll discover much more than a recently expanded engineering marvel that serves the shipping world. This area is rich in history. It offers a vibrant array of attractions, beaches, and natural beauty. Panama City also is an excellent starting point for exploring a compact yet geographically diverse nation. But a visit to the Central American country doesn't necessarily come cheap. Consider the following tips that will help save money on a visit to Panama City. Panama City is relatively close to the equator, so temperatures and daylight vary little throughout the year. But precipitation totals define two periods. Dry season is from January through May, and wet season runs from June-November with a brief respite most years in July and August. Carnaval, in mid-February, is a time in which accommodations might become more difficult to secure. Panama has only one major commercial airport, which is Tocumen International Airport in Panama City. Eight U.S. and Canadian airlines serve Panama City: American, Delta, United, Spirit. Air Canada, CanJet, Sunwing, and Air Transat. It pays to shop for airfare bargains. Flights from South Florida or Texas are sometimes quite inexpensive. Panama City offers upscale dining, yet this is a destination where budget travelers have little trouble finding delicious meals at reasonable prices. Many of the budget U.S. chain restaurants are represented here, but try to sample some authentic Panamanian dishes during your stay. Costa Azul, for example, is a favorite along Calle Ricardo Arias in the Campo Allegre section near the Marriott hotel. Decor and settings are simple, and food offerings reflect a variety of standard Panamanian favorites. Prices are modest and portions are generous. Down the street a few blocks is Cafe Beirut, which specializes in Middle Eastern fare. The prices are a bit higher, but the surroundings are more upscale. The salads are excellent, but the costs could fall within many travel budgets. Rule of thumb: to save money, eat like a local. Shopping for hotels in specific Panama City neighborhoods is a good idea, because there are some areas you will want to avoid after nightfall. Areas that are home to banks and casinos generally provide the safest bases, as those businesses hire armed guards who attend to entrances around the clock. Expensive chain hotels in these neighborhoods stand a matter of feet from inexpensive, clean, and convenient rental properties that are available through VRBO or Airbnb. On a visit several years ago, a one-bedroom apartment went for $60/night in the shadow of a chain hotel where rooms were $200/night or more. For a fraction of the nightly cost, you can get the benefits of the same secure neighborhood as most hotels. Driving conditions in Panama City are best described as chaotic. Lane markings in some areas are treated as mere suggestions, and drivers frequently pass on either side with no warning. Fender-bender accidents are common, and the average visitor is probably ill-prepared for the type of driving that is common here. With that in mind, car rentals are generally a bad idea unless you're heading out to rural areas. Taxis are efficient and inexpensive, with most rides within the city costing $10 or less. A taxi from the center of the city to Tocumen airport costs about $25. The city is developing a subway system, a first for Central America. The initial line, with 11 stations, opened in 2014. A "Rapi>Pass card" can be used to pay for rides. The initial purchase is $2, and the card is rechargeable. The top attraction in this area is the Panama Canal, which runs for about 50 miles between the Caribbean Sea and Pacific Ocean coasts. If you simply want to see the workings and understand the history, a visit to the Miraflores Visitor Center might be sufficient. For a modest entry fee, you may stand on an observation deck and watch the ships below enter the locks. The center also shows an informative movie in English that describes the construction process. For those who want a closer look at the canal and surrounding eco-zone, there are boat tours or a train that connects the coasts. Naturally, these options require a greater investment of time and money. Beyond the canal, Panama City offers other attractions that are both rewarding and inexpensive. 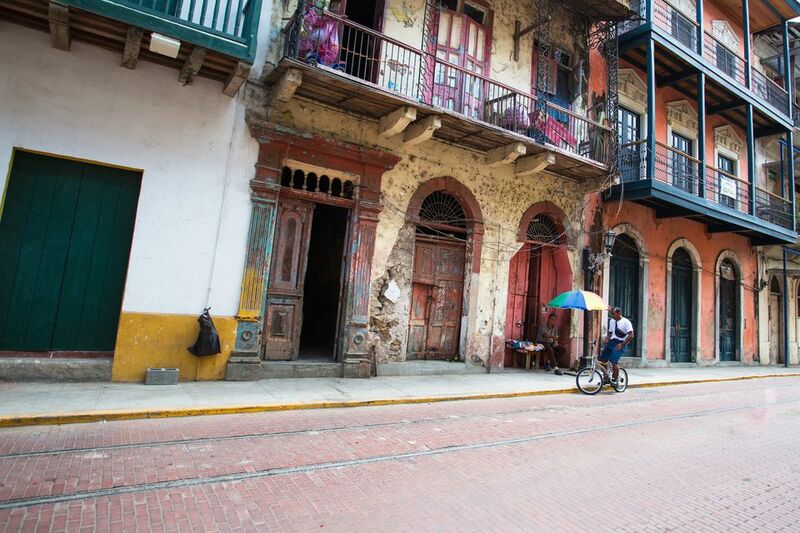 The Casco Viejo neighborhood offers some nicely preserved buildings from its colonial days. The area fell into decay until recent generations focused on preserving the history and the architecture. It is worth a visit, not only for the history lesson, but also for the views of the canal entrance along Almador Causeway and panoramas of the city's impressive skyline. In the heart of the city, you'll find Iglesia Del Carmen, a gothic cathedral that is among the most visited churches in the country. Beachgoers will find a nice selection of locations on the nearby Pacific coast, but those willing to travel a bit further can also enjoy more secluded places on the Caribbean side. Budget airlines and bus lines offer inexpensive travel opportunities in other parts of Panama. Some budget travelers enjoy a visit to Bocas Del Toro on the northern Caribbean coast near the border with Costa Rica. Great snorkeling, unspoiled beaches, and inexpensive accommodations await. Also within a day's journey is Boquete, a mountain city where the climate is far cooler due to the elevation. This area offers mountain retreats, hiking, zip-lining, and coffee plantation tours. It is a favorite of U.S. ex-pats, who retire here due to the mild climate and inexpensive cost of living. Budget airlines make these trips in an hour or less. A bus ride, although less expensive, will cost valuable time. The bus lines don't have a huge online presence, but you can board them at the Albrook terminal in Panama City. David, a city to the northwest, also is a bus travel hub. The San Blas Islands are more difficult to reach, but the rewards are great. Most of this island chain is uninhabited, but a few islands offer accommodation and an even closer look at the Kuna people than is possible in Panama City.